Hello hello! I thought we'd take a little break from all these epic restaurant posts with a super-quick recipe post! 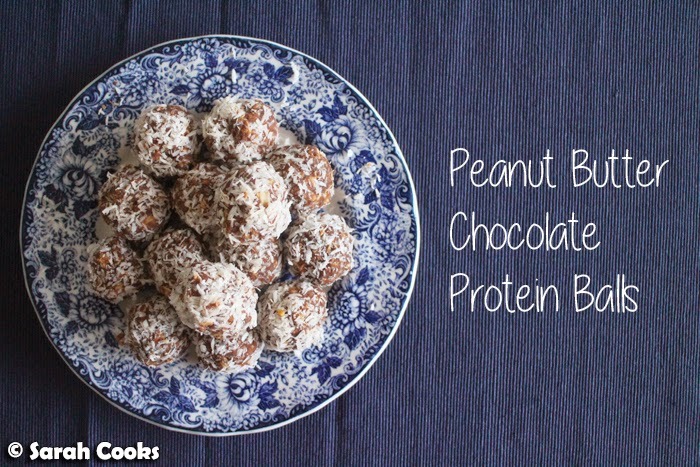 I first saw these peanut butter chocolate protein balls on the lovely Daisy's Instagram, and just had to have them! The recipe couldn't be easier - you simply stir together some peanut butter, protein powder, rolled oats and sweetener (maple, agave whatever), roll it into little balls and roll them in coconut. Bang. I made some slight changes to Daisy's recipe - using Sunwarrior chocolate protein powder instead of chocolate whey protein because I already had it, and adding a little soy milk to the mixture to help it come together. I also halved her recipe because I know it would be dangerous for me to be left alone in the house with a big plate of peanut butter balls! They are so, so delicious! I've been enjoying them as a pre-gym snack, eating one before a workout to keep my energy levels up without getting too full. (Doing burpees on a full stomach is a bad idea). Mix the peanut butter, protein powder, oats and maple syrup together in a bowl. Add enough milk to bring the mixture together and stir until combined. (It needs to be wet enough to hold its shape and allow the coconut to stick to the balls). Roll the mixture into small balls, then roll in coconut. Done. Yum. I made peanut butter protein balls with LSA the other day but I like the idea of adding rolled oats too. And oh gawd I hate burpees so much! These look great! I love having these as a good alternative to really sugary treats in the afternoon. Great idea adding peanut butter too! you had me at balls... but peanut butter and chocolate are also my favourite things! Making a smaller portion is a good idea... they do look like they could be dangerously addictive!